Avocado trees are evergreen trees that grow in tropical environments. Healthy trees have dark-green leaves and produce large egg-shaped fruit. Iron deficiency, also known as iron chlorosis, is common in areas with alkaline soils. Iron deficiency symptoms are similar to deficiencies of other minerals, especially zinc. A soil test will reveal the presence of soil alkalinity and how to correct deficiencies. Avocado trees suffering from iron deficiency have small yellowed leaves with green veins. Severe deficiency may cause leaves to be pale yellow or even white. Leaves may curl up, dry and fall off. The plant may bear misshapen or no fruit. Over the course of several years, severe iron deficiency can kill the tree. Iron deficiency is caused by a lack of available iron in the soil. Iron is not soluble above pH 7.5, so even though the soil may be rich in iron, it is not available for use by the tree. 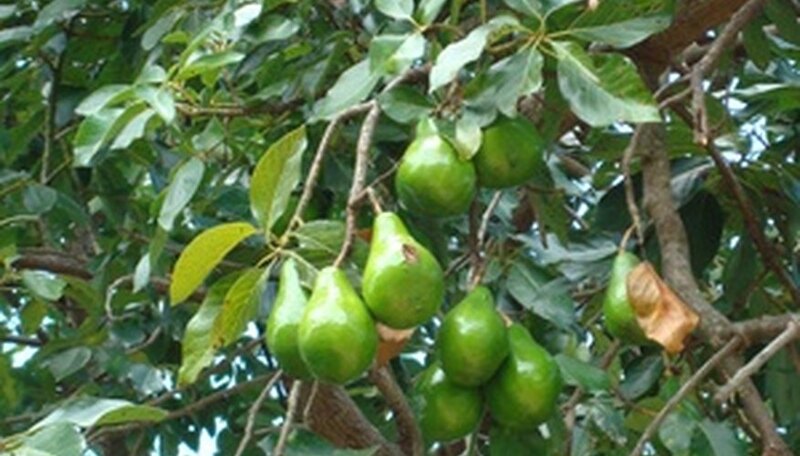 The avocado tree does not receive enough iron and suffers from nutritional distress. Iron deficiency can be prevented by applying iron chelates specially formulated for alkaline conditions to the soil several times a year. Iron chelate allows the existing iron in the soil to be used by the plant. Two to four applications of iron chelates between April and September will supply the tree with needed iron and prevent iron deficiency. When soil pH is acidic, between 6.0 and 7.0, iron chelates are not needed. Fertilize the avocado tree twice a year with a citrus fertilizer formula. Spraying the tree with a foliar spray containing iron treats the iron deficiency, but does not fix the underlying problem. Leaves sprouting after the spray will still show signs of deficiency. Improvement in alkaline soil can be made by applying 1 oz. of elemental sulfur per square feet of silty soils. Apply 2 oz. per cubic foot in sandy or clay soils. Mix the sulfur into the soil root zone. Over time, the sulfur is converted to sulfuric acid and lowers the soil pH. This treatment takes months or even years, but eventually cures the problem caused by alkaline soil. In mild cases, avocado trees improve immediately after application of iron foliar spray, but the problem can return if a regular maintenance program of iron chelate application is not followed. More severe iron deficiencies may take months or even years before improvement happens. Check the pH and iron content of your soil to be sure of the diagnosis and continue to treat the tree on schedule using iron chelates as a soil application and an iron foliar spray. Eventually the tree will recover.